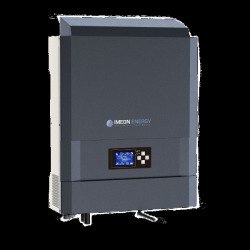 The IMEON inverter connects to your battery for self-consumption. The solar panel self-consumption with storage has never been so simple. Indeed, you connect the IMEON inverter in parallel to your electrical panel. This inverter is connected to your domestic batteries. The day you recharge your home battery using solar panels. In the evening, when you have electrical energy for self-consumption, you use the batteries. The IMEON inverter is really easy to install. You will find all IMEON inverter installation manuals, Imeon VDE certificates and technical data sheet. There are 2 models of IMEON inverters, the IMEON 3.6 inverter which outputs a power of 3kW in single phase and the inverter IMEON 9.12 which accepts up to 9KW of solar panel in three-phases. Depending on the available photovoltaic power and the energy stored in your batteries, it will choose the source to meet your electrical need. In case the available power is not sufficient, the IMEON inverter will take electrical power from the network. The IMEON inverter privileges the duration of your batteries. It ensures at most a discharge rate of 80%. 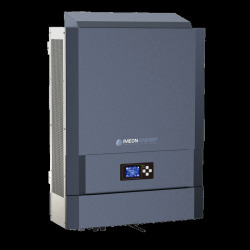 Buy the IMEON inverter on Alma Solar now with fast delivery and low cost shipping. Alma Solar is the official distributor of IMEON inverters.